Who does not love bananas. Since you were a baby it was the one universal fruit everyone ate. They are portable, come with their own wrapper and good for you. As a mom how many times did I search in the bottom of my diaper bag to find a banana I forgot I packed over a week ago? Come on you all know what I am talking about. Well ,they are also shaped perfectly like a smile. 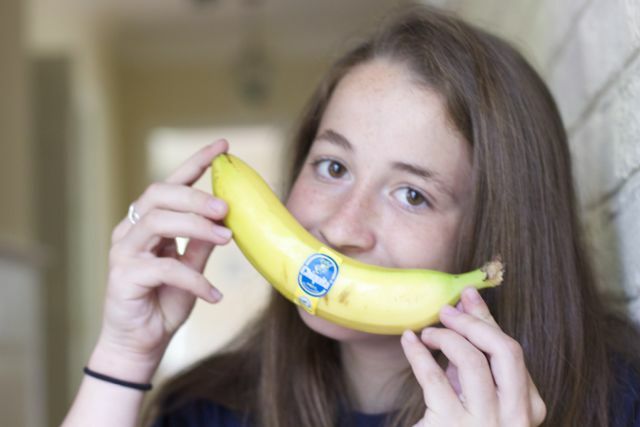 The folks at Chiquita want you to share your Chiquita Smile for a chance to WIN a Walt Disney World® vacation. Yes that is right, this contest is so easy and all you need is a Banana and a camera. 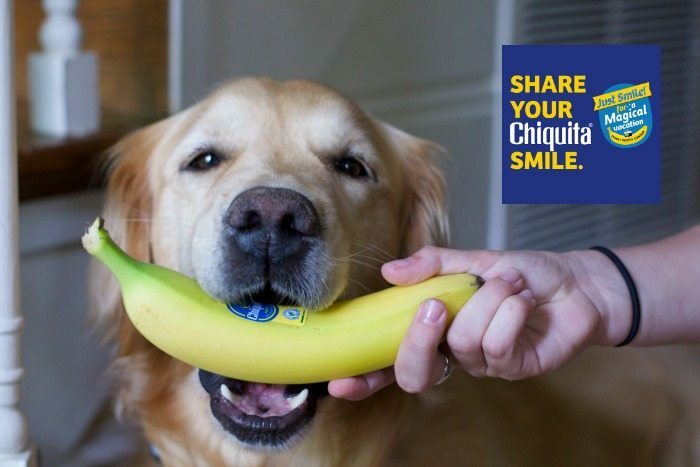 Not even a fancy DSLR camera, this Chiquita Smile Contest can be done with your smart phone. This post about sharing your Chiquita smile is being compensated by Chiquita as part of my membership with Mom It Forward Blogger Network. Chiquita goes bananas for Disney! Pick, Post, and Pose your best Chiquita smile for a chance to WIN a Walt Disney World® vacation from Chiquita! What is your favorite Disney Theme Park? 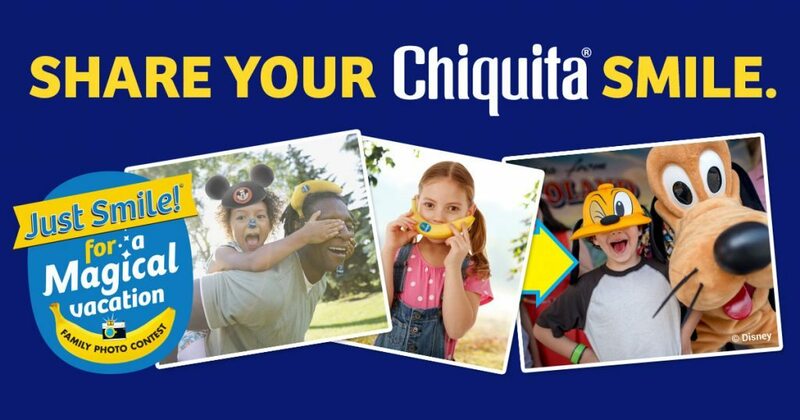 IF you won this Chiquita Smile Contest what park would you spend most of your time? ● DYK: Seven Dwarfs Mine Train is not like regular roller coasters, each mine car in this coaster is mounted in a cradle­like pivot, which allows it to swing side to side independently of the others. ● DYK: It’s a Small World®attraction appears in all of the Disney theme parks worldwide, i n c l u d i n g P a r i s , T o k y o , a n d H o n g K o n g .
● DYK:Dumbo the Flying Elephant® attraction has been a Magic Kingdom® Park favorite since the park first opened in 1971 in California.Walt Disney World® Resort in Florida has now doubled the fun! Now that I shared my favorite park and some of my Chiquita Smiles, let me see yours. Enter the Chiquita Smiles Contest. No bananas were eaten by dogs in this post! Enter to Rafflecopter below to win. Such a fun contest idea! We have never been to Disney it would be fun to win! I am voting for the puppy! 😉 I love this contest!! So much fun for everyone. We all eat at least one banana a day! What a fun contest. I’m going to have to get my kids to come up with a cute photo to share! What a cute contest. What a great prize!! Now banana sales will skyrocket….good for your health too!! How fun is this! That picture with the dog is adorable! 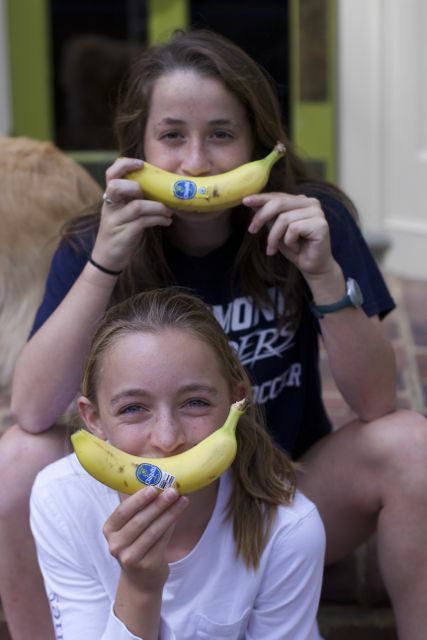 Love your Chiquita smiles! Especially the puppy one so cute! !